Updated: Non-story - it works now. Apparently, someone at FB or Websense saw the complaints and now allow it to be shared. The issue was the third-party Websense filter that FB implements, not FB itself. Your results based on filters. Check the video about Filter Bubbles on TED. Facebook and others define our information access just like the Editors of the bye-bye information brokers of old. Glad I closed my account years ago. It's from DuckDuckGo, so season with salt to your liking. I, personally, have had it with Google, and use DuckDuckGo almost exclusively. Yes, it has rough edges, but for what I do in life (programming) it suits me just fine. I think it's worth noting that this may have been in the course of being resolved by the time Mike posted, since in the screenshot above there are 3 "shares" on facebook already. I agree it should not have happened in the first place, but at least in this instance facebook was responsive, even if it wasn't an instant fix. seems to me that Facebook is losing the plot more and more. about time Zuckerberg got a grip on reality, sorted out the 'filter software' and stopped trying to dictate what is and isn't illegal. Agreed, deleting my Facebook account was the best thing I ever did. Anytime I try to mention Mike *******'s night of ******* where ****** ** ******** *** ****** **** and ****** **** ****** cheeseburger **** ***** *** **** and a honeycomb, I find my post censored. Don't deny it! I too am Yet Another eX-FaceBooker. From the comments here it kind of looks like its trending the way of Myspace. ...time to scoop up that name 'silverscarcat'...soon I shall have ALL the cool names on Facebook and then, let the bidding begin....mwahahahahaha!!!! I have had a Facebook account since 2003. I have exactly 17 posts. Why? Because I have no desire to broadcast every detail of my less-than-cool life to people. And I value privacy. I love Suckerberg. Make the most widely used platform in the world, claim it to be open and for the people, then censor and data mine the hell out of it. Chaching. I wish I thought of it first. There's nothing wrong with a person delighting in shoving their banal boring life details in everybody's face--it just means they're inconsiderate. I use G+ like a news site, posting articles that interest me. As for stuff that actually relates to me, I have very little(almost none). G+ and FB are nothing more than my way to share my view. NOT MY WORLD. It's totally related. Same graphics as the TED vid. Thanks for the heads-up on DuckDuckGo. I need to escape the bubble for work purposes more often than not. Zuckerberg says this: The more info you share the more I make money. Your privacy is of no concern to me. I am amazed by the amount of information you share for my companies benefit. Really that is true. Paraphrased but still true. As long as you understand that your deletion only kept YOU from seeing it, not Facebook, their advertisers or hackers. There's nothing wrong with a person being inconsiderate? Re: Updated: Non-story - it works now. The link is working now. I put it on my FB page. A little Streisand Effect in action. I have had a Facebook account since 2003. Considering Facebook didn't exist until 2004, your dates may be slightly off... :) But, otherwise, your point is valid. Amazing Facebook blocking a website belonging to the US DOJ or ICE or whoever. You think they would want to get behind a future entrepreneur! I agree the original was Facemash (Late 2003), but I was invited by an early adopter and did nothing but sign in. So technically my "Facebook" account is not valid until later. I only had access because of the person that was able to get access. So Mike you are correct my Facebook account is from 2004. ...would label anything as "spammy". 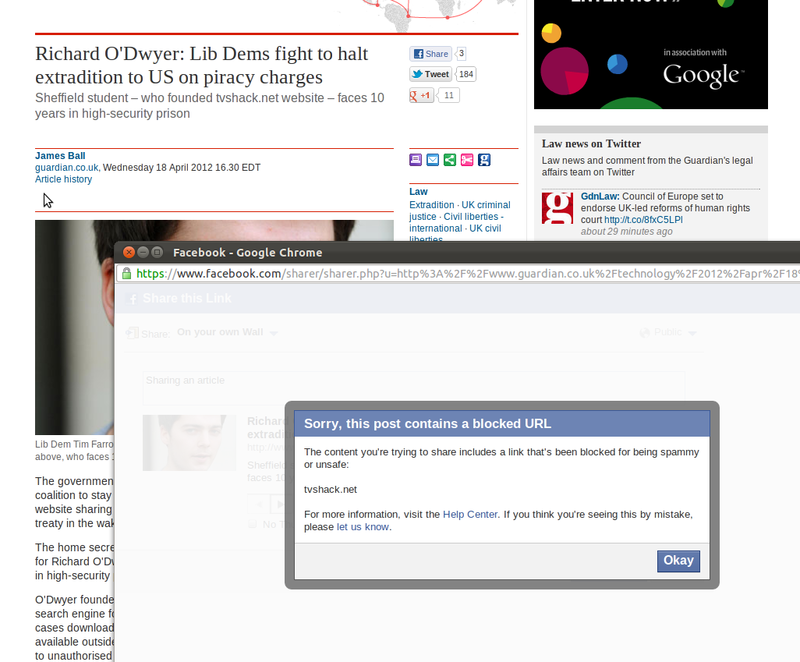 There were 6 shares when I tried yesterday and it was still blocking me, so i posted the Facebook warning instead together with the website address and the title of the article in question. with my face, there is No Way in Hell I would Join "facebook"
Companies claim that because they don't exert editorial control over what their users post, that the company therefore is not responsible for what their users say. But when a company starts exerting editorial control over posts, particularly posts that are about news or politics, at what point does the company lose that legal protection against being sued for slander/libel for what a user posted? Damn, I want some nights like this... do I? All this from 'The Land Of the Free'! Amazing how restrictive free can be these days! One more reason to ignore Facebook.